Today I am going to share with all of you how I created a galaxy themed pocket letter! I am using mostly the items that came in the April PopFizzPaper planner kit. The very first step is to gather all the supplies you will need. I decided to go with the paper that had the "Wish upon a star" quote. I measured it out and cut it to fit into each pocket sleeve. For the first pocket I kept it simple and just added some of star stickers to the bottom of the quote. I later went back and added a couple strips of washi tape to spice it up a bit. I did the same thing with the card to the right of that one. This next pocket is the one I decided to make into the shaker pocket. I added the sequins that came with the kit as well as some others that I had that I hoped would match well. I used a fuse tool to seal the pocket. The next pocket I decorated simply using a few strips of washi tape layered on top of a strip of scrap paper. I love how the silver glitter made it pop! The card on the right I just added strips of washi tape and more of the star stickers. I didn't want to add too much to the pockets that had the quote. For the next pocket I added a strip of scrap paper and stapled it to the card. I tucked some tags inside to make it a little pocket to hold the tags. I then added some alpha letters to spell out "tags" but you couldn't really see them with the bold background. So I added a strip of washi tape. Next I did one of my favorite techniques. I added strips of washi vertically and cut the ends into flag shapes. And at the bottom of the card I added a strip of scrap paper so you could see the alphas I added to spell out "washi". For the next pocket I added a strip of scrap paper down the center of the card. Next I layered some washi to the side of it and cut the ends into a flag shape. On the opposite side I added some star stickers. And for the last pocket I first added some strips of scrap paper and cut the ends into flag shapes. I layered them on top of each other for a little added dimension. I also added some star stickers to keep the theme going. Then I took a strip of silver glitter washi tape and ran it across the empty space. I then added a cute quote sticker in the corner. And this is what the pocket letter looks like all complete, as well as the backside so you can see a little sneak peak of how I filled it. I think it came out super cute! And I was so excited with how many supplies I could use from the PopFizzPaper kit. Let me know in the comments what you did with your kit supplies! I would love to know. Today I am going to share with all of you how I used the March PopFizzPaper planner kit to plan for this week! Watch the video below to see my entire process of planning. 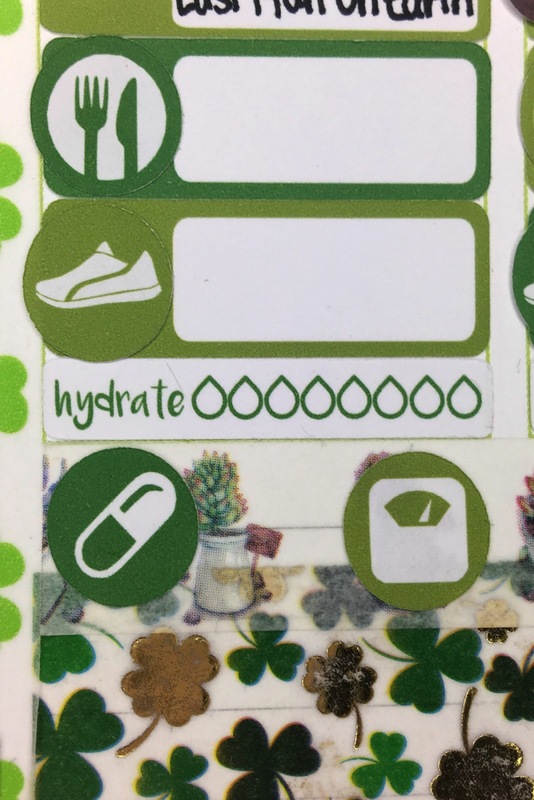 One of my favorite parts of this weeks spread was how I was able to layer all of my health related items. I'm so glad PopFizzpaper has so many different options to fit everyone's needs! Another one of my favorite parts from this weeks spread is the bath stickers from PopFizzPaper. The bubbles fit perfectly into the size of the Erin Condren box. 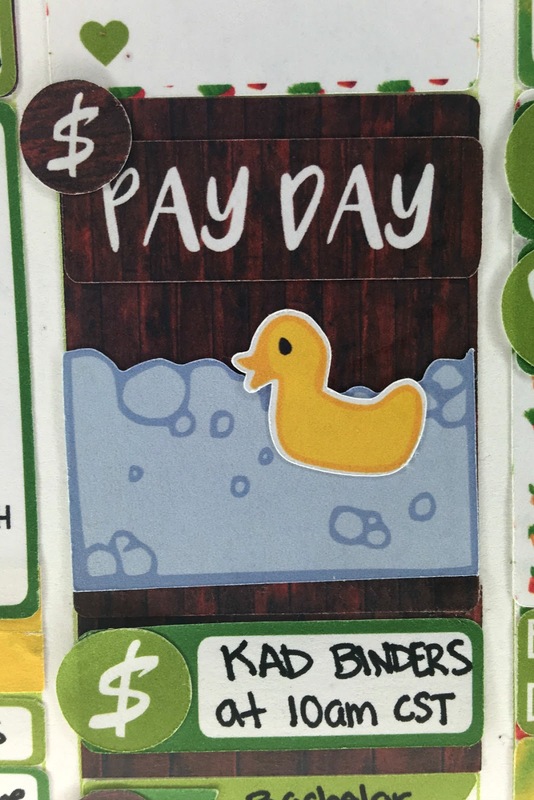 And layering the duck in the bath just made it extra cute! 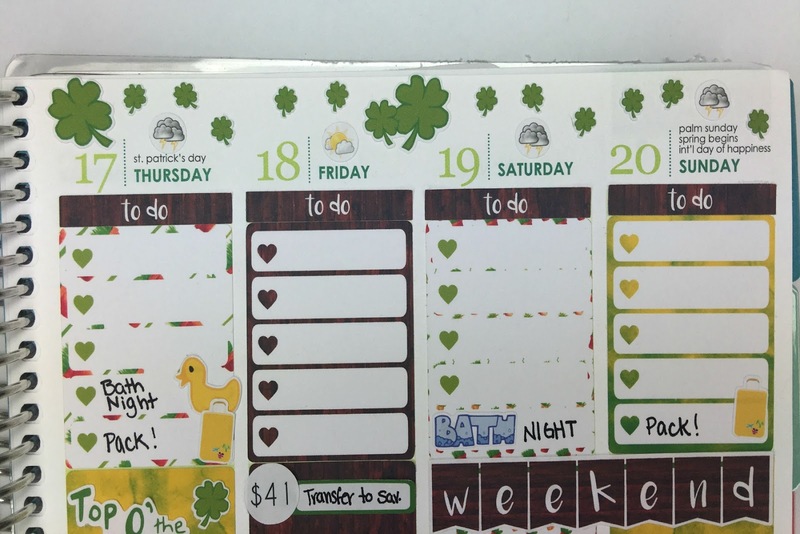 My final favorite part of this weeks spread was how I added all of the clovers that came on the holiday sampler to the top of the page. It added some much needed decor and looks super cute! I am so happy with how this week turned out! Every single sticker is from PopFizzPaper and I think that is pretty cool. Let me know in the comments what theme you went for this week. Today I am going to share with y'all how I used the journaling cards that came in the March PopFizzPaper planner kit! I decided I wanted to journal with these cards. The first thing I did was print out some pictures using my polaroid zip, because I knew I wanted to use pictures as well. The first card was pretty easy to start with. It already had all of the prompts written down so I simply just filled them in accordingly. And on the backside I added a picture of myself. I thought it went along well with the currently things since that is what I currently look like. The next card I kept fairly simple. I added a picture of my son and a caption with his name and age. The card itself is so beautiful I didn't want to take away from that by adding a lot. And I left the back of it blank. On the next card I journaled a little about my anniversary which was on February 24th. And on the back of the card I added a picture from our wedding day! On the next card I journaled about a recent visit to Florida. And I added a picture of my dog and my son. I left the back blank because it is just so pretty! And for the very last card I journaled about some goals that I have. I left the back on this one blank as well. Next I decided to hole punch my cards and tie them together with some twine. Now it can be a fun little book to look back on those memories! And that is my completed project! I love the way it came out and I truly hope it gave you some inspiration. Leave a comment on what you did with your journal cards! I would love to know. Today I am going to walk you through how I store and organize all of my PopFizzPaper stickers! I found this small photo album at Walmart for about 96 cents. They had many different colors and patterns. I decided to pick this one with a pink and gold foiled chevron pattern. If you can't find a pattern you like that is easy to fix by cutting down scrapbook paper to size and slipping that into the slots. Next I took the business card that comes with all orders and added some washi tape to the corners. I tapped it to the insert from the photo album. Then I placed the insert back inside the photo album. Now comes the fun part! Organizing all of my PopFizzPaper stickers! It's so great that they all fit so easily into the pages and you can fit multiple sheets into one slot. First I laid them all out on my tabletop and organized them into categories. Once that was complete I put whole categories in one sleeve starting with my most popularly used ones (Chores, Mail, and Finances) in the front and less popularly used ones towards the back. Now when planning I can easily flick through the pages and choose the ones I'm most likely to use and get planning easier. And that is how I set up and organize my PopFizzPaper stickers! I hope this helped you get some inspiration on how you can organize your stickers.Feel free to tell us how you organize your stickers or leave some tips and tricks in the comments. Today I am going to teach you all how I created a donut themed pocket letter using mainly the supplies that came in the February PopFizzPaper planner kit! Any extra ephemera or embellishments you may want to use. Next thing I did was draw out the size I wanted the papers to be and I measured it out with my ruler. 2.5 inches wide by 3.5 inches tall. It might be a little hard to see on the sprinkle paper, but in person I could see it just fine. After that I placed my paper on my paper trimmer and cut all of the sheets down to size. I decided to hang onto the scraps in case I wanted to use them in the pocket letter. Next comes the hard part. Choosing which papers you want to go in what pocket. These are the ones I picked and how I decided to lay them out. Here is how the first pocket came out looking. I added a piece of scrap paper and cut the ends to make it look like a flag. Then I added a heart sticker from the sticker sheet that came in the kit to the corner. I also added some alpha letters to label what I was putting in that pocket. This next pocket turned out to be one of my favorites! I did the same thing as the last one for the scrap piece but this time I only cut one end. Then I added a donut sticker on top of the flag. At the top of the card I added layers of washi tape and cut all of the ends into flag shapes. Then I took a scrap piece of a sticky note and cut it to look like a flag so I could layer some alpha letters on top and you would still be able to read it. This next pocket I kept fairly simple with the giant sticker. I just added a small bit of washi and cut it into a flag shape. I also added more alpha letters to label what this pocket would hold. I experimented with ink for this pocket. I tore off this donut checklist from a sticky note pad and inked the frayed edges so it would stand out against the background. I also layered some washi underneath to help make it stand out from the pink background. Then I added a sticker to the side that says donuts. This next pocket I kept really simple. I just added rhinestones to the outside of the pocket inside in the donut holes of the paper. I love the paper that came in this kit so much so I thought it deserved to really stand out! Here is what it looks like inside the pocket. For the center pocket I made it a shaker pocket! All I did was stick the paper I wanted inside and then added sequins on top of the paper. After that I sealed it with a strip of washi tape. I continued the trend with this pocket by adding a scrap piece and cutting it to look like a flag. As well as the heart sticker and alpha letters. I also layered some washi tape on the side and cut them to look like flags. For this pocket I took a long piece of the scrap paper and put it horizontally across the paper and stapled the ends to the original paper. I then cut out a circle on a sticky note pad and inked the edges. Then I adhered it to the strip of scrap paper with my adhesive roller. And finally added some alpha letters to spell out tags. The last pocket follows along with most of the others. Scrap paper on the bottom cut into a flag shape, heart sticker, and alpha letters for labeling. As for the sticker, it's from the sticker sheet that came with the kit. It was very large so I cut it in half and placed them crookedly on the card to make it look unique. I also added some sequins to the top left corner and added rhinestones in the center of the sequins. And this is what the final product ended up looking like! I really love it and I hope the recipient does as well. 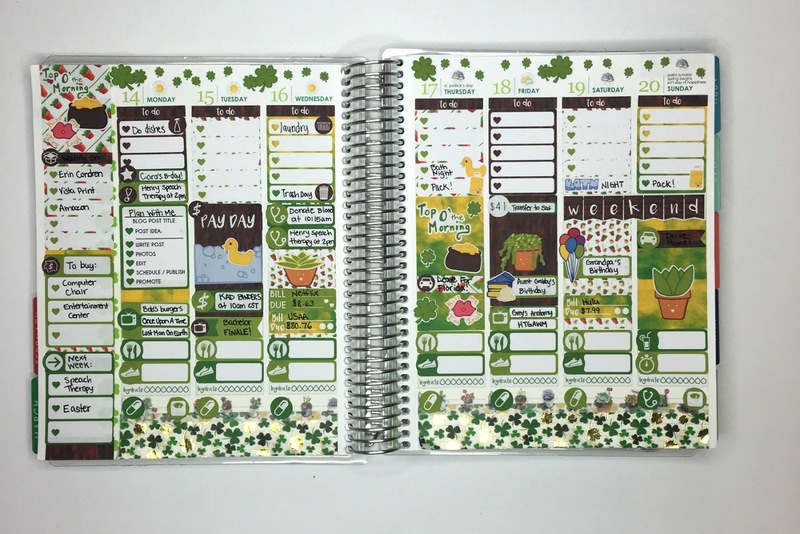 The PopFizzPaper planner kit had so many items to make this that I hardly had to pull from my own stash! In this video I show what I put behind each pocket. What did you do with the items from your February kit? Let me know in the comments below! This week I am using nearly all stickers from PopFizzPaper! I will be incorporating the stickers that came in the February planner kits as well as some of the stickers I received for being a creative team member. You can watch my "plan with me" below to see the entire process of how I created my weekly layout. One of my favorite elements from this layout is the layering. Particularly what I did in the top right corner where the "thankful thought" box is at. This adorable quote sticker really stands out against the sprinkled background. It is also a perfect motivational message to keep me going for this week! Another favorite area in this weeks layout is where I annotated my mother in law's birthday. I used the circle appointment labels and the birthday sampler to create an adorable little collage. The way the stickers are designed really made this element pop! These video boxes are sure to keep me organized and on schedule! It has a blank lined area to write the title of your video, which is spectacular. And it has a very detailed heart checklist for everything you need to do to get your video prepared, uploaded, and promoted! The end result of this week was beyond what I had anticipated. I absolutely adore it! Be sure to check out PopFizzPaper to purchase these stickers and create a donut weekly spread for yourself! And if you do end up making a purchase be sure to use the coupon code "NAOMIPLANS15" for 15% off your order no minimum!